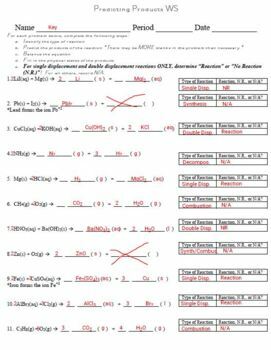 This worksheet is a challenge for students! Given reactants, can your students identify the likely type of reaction? Can they write formulas for the products? Can they balance the equation, predict the states of matter for each product, and then FINALLY predict whether or not the reaction is likely to occur? This worksheet gives students 11 different problems to solve. 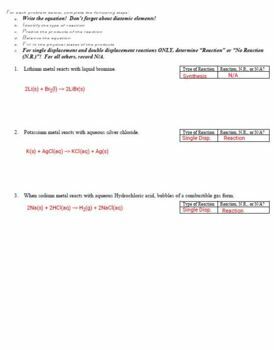 For even more challenge, the worksheet ends with 3 additional problems that require students to translate the names of the reactants into formulas to start the process! This will truly test your students and their skill! This product comes in WORD format, so it is easily edited.